Lineage. Organized as 120 Aero Squadron on 28 Aug 1917. Demobilized on 17 May 1919. 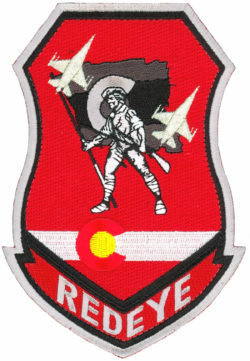 Reconstituted and consolidated (1936) with 120 Observation Squadron which, having been allotted to the Colorado National Guard, was activated on 27 Jun 1923. Ordered to active service on 6 Jun 1941. Redesignated: 120 Observation Squadron (Medium) on 13 Jan 1942; 120 Observation Squadron on 4 Jul 1942; 120 Reconnaissance Squadron (Fighter) on 2 Apr 1943; 120 Tactical Reconnaissance Squadron on 11 Aug 1943. Disbanded on 30 Nov 1943. Reconstituted on 21 Jun 1945. 120 Fighter Squadron, and allotted to Colorado ANG, on 24 May 1946. Extended federal recognition on 30 Jun 1946. Redesignated: 120 Fighter-Bomber Squadron on 12 Apr 1951; 120 Fighter-Interceptor Squadron on 1 Jul 1955; 120 Tactical Fighter Squadron on 1 Jan 1961; 120 Fighter Squadron on 15 Mar 1992-. Assignments. Unknown, 28 Aug 1917-Sep 1918; Second Aviation Instruction Center, Sep 1918-Feb 1919; unknown, Feb-17 May 1919. Colorado NG (divisional aviation, 45th Division), 27 Jun 1923; Third Army, 6 Jan 1941; III Air Support Command, 1 Sep 1941; 77 Observation (later Reconnaissance, Tactical Reconnaissance) Group, 12 Mar 1942-30 Nov 1943. 140 Fighter Group, 1 Oct 1946; 140 Fighter Wing, 1 Nov 1950; 140 Fighter-Bomber Group, 12 Apr 1951; 140 Fighter-Interceptor Group, 1 Jul 1955; 140 Tactical Fighter Group, 1 Jan 1961; 140 Tactical Fighter Wing 9 Dec 1974; 140 Fighter Wing, 15 Mar 1992-. Aircraft. In addition to O-2, c. 1927-1934, included JN-4, PT-1, BT-1, O-17, and O-38 during period 1924-1935; O-19, c. 1935-1939; in addition to O-47, 1938-c. 1943, and apparently P-39, 1942-1943, included O-49, 1941-1943, and P-40 and L-4 during period 1942-1943. P-51D, 1946-1953; F-80C, 1953-1958; F-86E, 1958-1960; F-86L, 1960-1961; F-100C/F, 1961-1971; F-100D/F, 1971-1974; A-7D, 1974-1992; F-16C/D, 1992-Present. Operations. Primarily aircraft maintenance, 1918-1919. Patrols on Mexican border, Dec 1941-Jul 1942; aerial Support for training ground forces, 1942-1943. Called to active duty as part of the Korean War call-up, 1951-1953. “Minute Men” Aerial Demonstration Team designated as the official ANG team, 1956-. Called to active duty as part of the Berlin Crisis call-up, 1961-1962. Called to active duty as part of the Pueblo Crisis call-up, 26 Jan 1968 and deployed to Phan Rang AB, Vietnam on 3 May 1968. Flew 5905 combat sorties in 11 months. Won Gunsmoke Competition in 1981. Service streamers. World War I: Theater of Operations. World War II: American Theater. Emblem. Approved on 12 Apr 1957.